We see Mary Shelley as the author of Frankenstein and The Last Man, two novels that, in the opening decades of the nineteenth century, did something new: something that we now see as establishing at least three of the modes which make up what we call science fiction. In Frankenstein, Shelley extrapolated from current scientific theory and experimentation to suggest that “life” could be artificially created, and presented the moral and ethical relationships of scientist to “creation” in a way that (for the times) was startlingly modern. In The Last Man, she developed the apocalyptic “end of the world” motif which haunted Romantic poets such as her husband Percy and, of course, Byron, whose suggestion in 1816 to his guests at the Villa Diodati that they each write a “ghost story” had sparked Frankenstein. Even more, she secularised it. The Last Man was, also, one of the first—if not the first—English novels set in a recognisable future, with a technology (ballooning as an institutionalised mode of transport rather than, as it was in the 1820s, a gosh-wow spectacle) marking that future as “different.” Most of her subsequent fiction, written to support herself in the troubled years after the death of Percy, drew back from such innovations, or rather, innovated in a different way (the “historical novel” into which category such works as Valperga and Perkin Warbeck fall, was itself a comparatively new mode). However, her experiments with short fiction, some of which remained unpublished in her lifetime, can be seen as experiments with form and genre, and it is as this that they are presented in Beyond Frankenstein, a reworking (essentially a retitling, with new introduction) of 1996’s The Mortal Immortal: The Complete Supernatural Short Stories of Mary Shelley. Modern readers may find the Gothic/Romantic style of Shelley’s prose something of a barrier, though it is much less so than might be thought. This is the model, though, that Edgar Allan Poe, not to mention H. P. Lovecraft, adopted for a rhetoric which oozes both melodrama and ennui. “I will tell my story, and my reader shall judge me. I will tell my story, and so contrive to pass some few hours of a long eternity, become so wearisome to me. For ever! Can it be? to live for ever!” So the narrator of “The Mortal Immortal” launches into his tale, in a manner that we have probably read far too much of, and will happily dive into again. 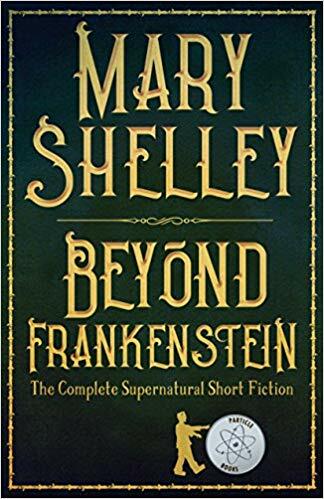 And when Joseph Weisman writes, “If any story in Beyond Frankenstein reaches the heights of Frankenstein, it is, without a doubt, ‘The Mortal Immortal.’ Shelley’s riveting tale of the potential ravages of immortality is in almost every way as compelling,” he is probably exaggerating. But not too much. Winzey, the narrator, is the “sorcerer’s apprentice” made famous by Goethe (and Walt Disney). In this case, the sorcerer is Cornelius Agrippa; and Winzey is not the apprentice who famously raised the devil against instructions and was carried off, but a lesser apprentice who similarly ignores his master’s instructions to watch over the elixir which is brewing. Young Winzey is having romantic issues over Bertha, who seems to be casting her favours elsewhere, and drinks the mixture under the impression that it is a kind of anti-love potion. In fact, what he drinks is a potion designed to confer immortality, as Agrippa reveals shortly before he dies. Winzey finds himself still outwardly a twenty-year-old, while Bertha ages. Possibly because he only drank half the potion (spilling the rest), Winzey feels the inner effects of age even as he remains outwardly young. Is he cursed simply with longevity rather than immortality? Shelley focuses upon the anxiety instilled by the knowledge that he is simply perhaps immortal, and Winzey’s temptations to test his fate without falling into the moral traps of suicide or causing some other to be guilty of murder. The narrator of “Transformation,” also originally published in the anthology annual The Keepsake, likewise confesses his tale of “impious tempting” in the same way as any Gothic narrator who cannot fail to reveal their inmost squalor. Like the narrator of Coleridge’s “Rime of the Ancient Mariner” (which provides the story’s epigraph), obsessively telling their “ghastly tale” whether the audience wants to hear it or not. Guido, affianced to Juliet, proves arrogant and self-willed and returns to Genoa having dissipated his inheritance, still determined to marry Juliet. Her father, who knows him too well, insists on imposing restrictions upon Guido’s control of the fortune that is to come to him upon his marriage. The result is a series of attempted kidnaps resulting in exile. Wandering alone on a seashore wracked—this is a Gothic, so we know what to expect—by storms that reflect his interior passions, Guido comes across a “misshapen dwarf” who claims to have caused the storm and offers to exchange his treasure chest and the chance for revenge for a three days’ swap of their bodies. After the three days are up, there is no sign of the dwarf, and Guido, in his monstrous form, sets off in search, to discover (as if we haven’t guessed) that “the penitent, reformed . . . Guido” is to be married to Juliet. The story’s ending, Guido reflects, might suggest that the supernatural events were part of a moral lesson designed to show him the error of his ways; the doppelgänger imagery and the bodily transformations show that the themes of Frankenstein were still not far from Shelley’s mind. The publication of these stories, and the fourth one, “The Dream,” in The Keepsake suggests a certain level of hackery: at least two of the three Keepsake stories were clearly written to go with preprepared illustrations, and Shelley herself tended to disparage that side of her work. She needed the money, and gothic stories for The Keepsake paid well. But even though “The Dream” gives us all the trimmings—with a full supporting cast of aristocratic young woman (Constance) determined to end her days in a convent rather than marry, King (Henry IV) equally determined to see her decently wed to a vassal of his choice, background of family rivalry, and lover threatening to sacrifice himself in a crusade—its rhetoric is energetic: fully alive melodrama. Speak not of love, Gaspar!—a sea of blood divides us for ever! Approach me not! The dead and the beloved stand even now between us: their pale shadows warn me of my fault. This handwaving is all very well, but Shelley manages to move the story to a point where the unhinged conventions of the Gothic (even what seems to be a ghostly dark boat rowed soundlessly in the Loire) take on a stable sense of their own. Constance determines to bring matters to a head by sleeping on “St. Catherine’s couch” and acting according to the dictates of the dreams the saint is supposed to send. The point is that the “couch” is a narrow ledge above a precipice: the sleeper is almost bound to topple into the river below at the slightest movement, and when Constance dreams that she sees her lover in a Saracen dungeon her instinct is to leap forward and save him. Fortunately, both young Gaspar and Constance’s servant, Manon, have a certain pragmatism about them, and the moral that “to make the living happy [is] not to injure the dead” and loyalty to family feuding should not take precedence over natural attraction survives to make the story one that concludes as safely-romantically for a Keepsake audience as it undermines the model of Romeo and Juliet which that audience would have shed sentimental tears over. The antiquarian society had eaten their way to several votes for medals, and had already begun, in idea, to consider what prices it could afford to offer for Mr. Dodsworth's old clothes, and to conjecture what treasures in the way of pamphlet, old song, or autographic letter his pockets might contain. [T]hese ruins—they are grand, but how miserable a tale do they tell. These baths did not exist in my time. They existed in all their magnificence some hundred years after I had forgotten the world. But now their roofs have fallen; their pavements have disappeared; they are grass-grown, weed-grown. The feeling of surviving tradition felt by Valerius is suddenly snapped when his attention is drawn to the cross that marks the presence of a different religion in the Pantheon. Shelley’s own work here is fragmentary: we can only wish for the novel that could have risen from the ideas here, and the relationship between Valerius and Isabell Harley, whose observations of the Roman form the last part of the story. The disadvantage of reprints such as these is that the originals may well be available for free via the internet. Here, though, we also have both a brilliantly incisive commentary upon the stories, and a piece of metafiction worth drawing attention to in its own right, in the shape of Michael Bishop’s “The Unexpected Visit of a Reanimated Englishwoman: A Narrative Introduction,” in which Mary Shelley herself visits Bishop to discuss her stories (and sometimes to chide the critic in Bishop, and in all of us). Bishop describes her “skeptical glance at the multicolored paperbacks converging in the corner behind her” as she asks him not to claim too much for them as exemplars of “science fiction” (the exasperation in her voice comes straight from the page, though Bishop fights back with his argument that in her “reanimation” stories she may have pioneered alternative histories.) And yes, Brian Aldiss is mentioned. This is, of course, fiction. We are, in this 200th anniversary of the publication of Frankenstein, being given a version of Mary Shelley which echoes our own preconceptions. (And for many of her readers, being the “mother of science fiction” is only part of her achievement.) But the fiction serves to remind us that she was a writer who deserves to be known as much more than someone who kickstarted a genre, however much we are committed to the importance of that genre. Beyond Frankenstein gives us fragments, but they are valuable fragments of a writer whose gifts still have yet to be fully appreciated.